Looking to purchase a Nokia Lumia 810 off contract? The cheapest price right now appears to be directly through the Microsoft Store (both online and in-store). If you head on over to the Microsoft Store website and look at the Lumia 810 product page, you’ll notice a price of $449 once you select the “Replacement Device” option (which will not extend your contract). You’ll also be looking at a $4.99 two-day shipping fee if you order online. If you’re looking for deals on upgrades directly from Microsoft, however, you’re not going to find anything too drastically different than if you were to upgrade directly through T-Mobile: The price for an upgrade on classic plans is a solid $149. The good news is that there is no $50 rebate needed in order to get that price. Still, we’ve seen better upgrade deals for classic plan holders elsewhere, so nothing groundbreaking here. Going back to that in-store purchase at the Microsoft Store, it truly is a fairly painless process… aside from parting with your hard-earned money of course. Ask for the device you want, give your name and email address (they email a copy of your receipt alongside the physical copy you get), get offered the chance to purchase optional “Microsoft Assure” phone insurance ($99 for 2 years, covers defects, accidental damage including water damage, always replaced with a new phone never refurbished, etc), use your method of payment, and you’re on your way. If you don’t currently have a microsim, which you will need for the Lumia 810, you may need to stop by a T-Mobile store to get it activated. 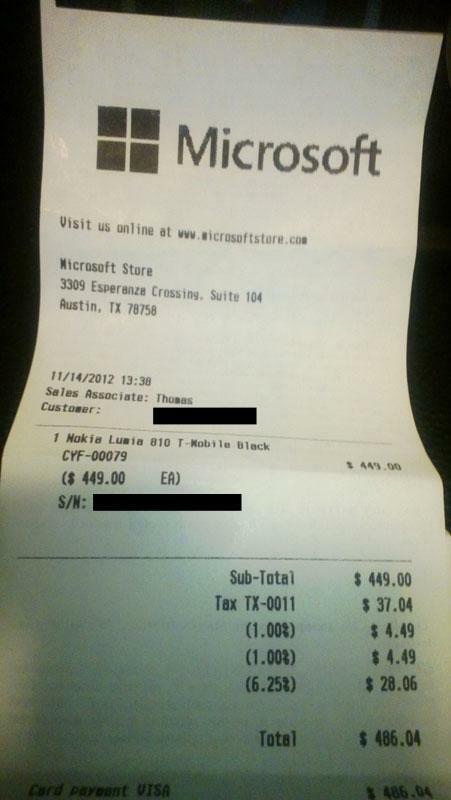 You can ask your local Microsoft Store if they do in-store sim-to-microsim swaps, but the employees in the Austin, TX store apparently don’t know how or can’t – they can do activations though. Seriously? This is a killer deal. It’s a mid range phone of course it’s not going to have a premium price tag. Wirefly.com has it for $486 (free shipping and no tax for most states), though it will “ship when available”. So if we wait for 3 months, it’ll be $200 + $50 Prepaid Activation on T-mobile Prepaid! LOL! That would truly make it the 710’s progeny. Very curious about Nokia with WP8. Need to go play with a live demo. I upgraded my home notebook to Win 8 pro for $40 to get a feel for Live Tiles. Its not touch but it does give me some idea or reference to the OS on a hand set. Along with that I have a full on Microsoft store near me where I can go and play with the all of the phones. Also there is an app for Android that mimics Live Tiles. I ran it for the employees and they got a kick out of my “Androws” phone :) I have a year of contract left with my Tmo Samsung Galaxy II……. I have a T-Mo S II as well but I will try that Windows mimic app out. 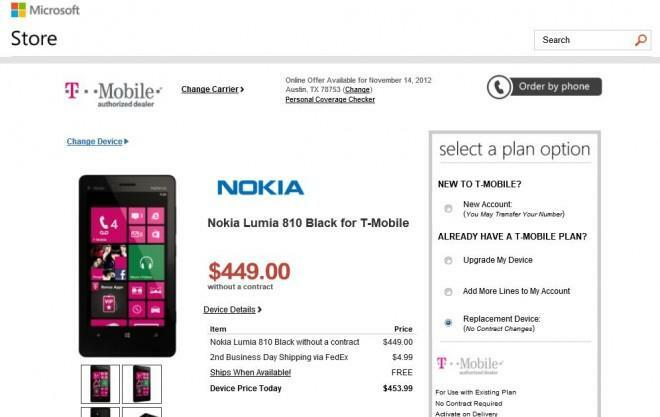 WP8 looks legit, need to see where a Microsoft store at near me here in 312. I haven’t had a Nokia since the N-Gage as a young’n, but wouldn’t mind a Nokia WP8 as a legit back up. What is the name for the Android app? Is it free? I think he is referring to “Launcher 7” which is a home screen launcher replacement. On my Android phones I use the “Go Exe” launcher app. IMO it makes Android work the way it should have out of the box. Anyway, what Go EXE calls “themes” can change the look, interface, and functionality of the home screen, icons, and other aspects the phone’s operation. Many Go themes are free, some are 99 cents. All are available in Market or Play. There’s about ten Windows Phone themes available. Some are an unsophisticated shell, others almost turn an Android phone into a Windows Phone. We can thank the Nexus 4 for this new trend. $450 sounds like a good deal for this (mid range) phone but I think it’s just okay. $450 for the 920 would have been a good deal. I really appreciate this article/site . This will be my next phone once I can get it for under 400 which I suspect will be right after the holidays . Thanks for the info . I bought my laptop from the microsoft store two months ago . I got it for a silly good price & no bloatware . Ouch !! The 920 is 449.00 , How does that refarming thing work ? I picked up the 810 yesterday at my local T-mo store. I have to say, for $149, and they also gave me a rebate card for $50, which will make it $99, the phone definitely does not feel “mid-range.” I am coming from a Sensation 4g, and so far, I really like the 810. The screen is very nice; I haven’t noticed the downgrade in resolution from the Sensation. This may be due to Windows font smoothing. The build quality seems very good; the polycarbonate back and wall-to-wall glass on the front make it seem much more expensive and premium than the cost suggests. I have experienced no lag in the UI, and apps seem to spring to life very quickly. The Nokia apps seem like they actually add some value, even though I’ve really only played with Nokia Drive, and the Photo apps. I used the Drive app today to navigate to a doctor’s office, and it even alerted me when I was speeding. Seems much “slicker” than even Google Navigation on my Sensation. Now, there are a few apps I will miss, such as Spotify and Tune-In Radio, that are not available on Windows. However, other things, like the email and Office apps experience are just too good to pass up. I have a deadline on a magazine article in like 2-3 hours. I was not going to say much about Windows Phone, but on seeing your detailed and excellent comment I would like to post parts of it in the article. Please post on here if that’s OK. (I can post your screen name if you like, in the article). If I don’t hear from you I may post a link to this page and say “some people are really liking the Windows Phone and Nokia 810 handset.” See…. P.s. You can also e-mail me, David has my e-mail. It is 12:00 noon PST and I need to submit the article by 3:00 PM PST. Spotify and TuneIn Radio may not be available for WP8 from what I’m hearing. But, they are available for WP7. Nexus 4 is $299. much better eco system and OS, IMO. Nexus 4 is unlocked, 5 bands, it is a flagship phone.